The topic of leadership has grown in importance, and how and when managers communicate is critical to their effectiveness. 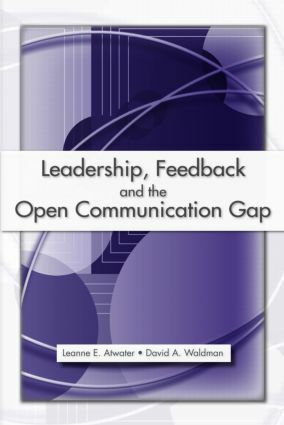 This book provides insight for managers to understand the feedback and open communication processes. It suggests guidelines for how and when managers should engage in negative feedback and open organizational-level communication with followers, including when such feedback and information should not be shared. It also adds to the existing knowledge base pertaining to open communication on the part of managers. This book will be of value to managers and practitioners involved in the practice of leadership as well as for courses on leadership, organizational behavior, human resource management and organizational communication. Leanne E. Atwater is a professor of management at Arizona State University. She received her Ph.D in Social/Organizational Studies from Claremont Graduate School. Her research interests are 360 degree feedback, Leadership and Gender issues in management. Leanne was just made a Fellow of SIOP at their 2007 convention. David A. Waldman is a professor of management and Director of the Institute for International Business at Arizona State University. He received his Ph.D from Colorado State University in industrial/organizational psychology. His research interests focus largely on leadership, especially at strategic levels of organizations.